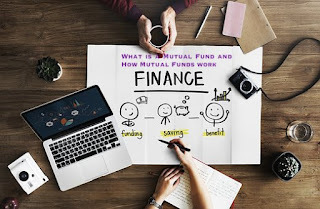 The word mutual implies a group of people coming together And funds means pooling of money therefore the term mutual funds suggests a group of people putting their money together to buy stocks and bonds or in some cases a combination of both. Think of it like this a baker bakes a million pound cake.The cake is made up of a variety of ingredients each ingredient is an individual stock or bond the list of these ingredients makes up your portfolio this fund is managed by a professional fund manager who manages this pool of money and builds a portfolio. Which is in line with the investment objective of the scheme investments are spread across a wide cross-section of industries and sectors .This ensures that risk is controlled because all stocks may not move the same direction and the same proportion at the same time .It helps balance things out. What are mutual fund units and how is their NAV calculated? Mutual funds issue units to the investors in accordance with the quantum of money invested by them investors and mutual funds are commonly known as unit holders when an investor invests money in any scheme he or she is allocated units the value of each unit is called NAV. It's reflective of the current market value of a single unit of the funds holdings when investors invest in the fund .The baker cuts the cake into many pieces and sells it by the peace .Each piece comes at a price in accordance with the amount you paid a proportionate amount of the cake is Then owned by you the number of units that an investor can buy depends upon two factors the NAV of each unit scheme divided by the total number of units of the scheme on any particular date . So if the NAV is Rs.15 and investor invests fifteen thousand rupees in the scheme then he or she will be allotted one 1000 units so basically net asset value is the current market value of one unit of the scheme take a piece of cake for example each piece of cake includes all the ingredients in various amounts each ingredient has a market value the combined market value of all the ingredients in the cake contributes to calculating the NAV of the cake . However it must be noted that this value keeps changing everyday since market value of securities changes everyday NAV of a scheme also varies on a day-to-day basis mutual fund investments are subject to market risks read all scheme related documents and information carefully before investing. Friends ,every month when your salary is credited then you keep some part of that salary as savings. You keep some money for your later use, maybe for emergency or if you want to be the house, or car and you save for that. so what are the ways to save. One simple way is that you keep your salary as it is in the bank and it gets collected. It's a not very good way friends, because such a money loses their value Inflation is increasing in our country and due to that the price of the commodities are increasing to. So, the value of your money keeps decreasing every year by 4-5% according to the inflation rate. People invest the money so that they don't lose their value kept just lying. There are different places to invest. Our country has mainly 4 places for investment. No 4. is Real estate. Some people who wants to take more risk also invests in No5stock market which is another way to invest your money. Every Investment has 3 things, Return, risk and time. Return means how much percent of profit are you earning through the investment, this is normally seen in percentage. if our inflation rate is 4% then you should see that your profit return is more than at least 4 % Otherwise there is no point of investment if you have put your money and the value didn't increase. because the inflation rate is also increasing Risk means how risky it is to invest, what is the chance of losing all your money in that investment. For how long are you investing. So the basic risk here is that if the time is more, risk is more then the returns will also be more. If you want more return percentage on your investment then you will have to take more risk and should invest for a longer period Saving accounts has the minimum risk and there is no restriction too. You can save or take the money out at any time. But the return we get here is also very less, only 4% whereas our inflation rate in the last few years have been 4-5% . Fixed deposit is also a less risky option but it has a time limit before that we can't take the money out. hence the return is also a bit more, somewhat 7-8% . Why MF grows in Indian market? Gold and jewellery these days have a significant risk, their prices fluctuate a lot. If you are going to see this history then you will know that until 2012 the prices were consistently increasing If you would have invested prior to 2012 then you would have got a good return here. But after 2012 there have been a lot of ups and down but they have maintained a level, hence there's not a much profit. Investment in the properties and real investment has low to moderate risk I would say You can see the India's housing prices in the last few years. It has come up and down a lot. In the quarter or March 2011 it has touched the return rates of 30%and in March 2018 latest quarter then it gives just 5% return rates. One of the disadvantage in investing in housing is that it needs a lot of capital, you need to have lacs and crores of rupees to invest. So this is a disadvantage. Lets see stock market friends, you can get a lot of returns here but also loss. The risk of investing in stock market depends on the stock where you are investing. You need to have a good knowledge of the performances of the stock and how does the stock market works basically. You shouldn't be investing here if you don't have this knowledge. So these are few main types of investments and saving that I have told you but there are some other types too. like Government bonds, corporate bonds, we have crypto currency too these days, people also invests in bitcoins . A general well known advice is that One should never invest your money only at one place. You should invest at different places so that if there's any crash then you will not have to bear the over all loss. It's a very less chance of everything crashing altogether like, gold, properties and even stock market. As this happens were rarely ,chances are that if one thing crashes then you can get profit from the other. This is called as diversification, you have to invest at different places. Mutual funds is a special kind of investment through which you can invest on different types together. You can do a diversifies investment by investing at one place. Basically in Mutual Fund ,you give your money to Asset Management Company and many people like you do so. And those company invest all the money collectively at different places. They have appointed experts and with their suggestion they invest the money. They invest money at different places and the return rate they get collectively from these different places out of that some small percent of 1-2% is kept as a profit by the Asset company and the rest you get back as per that return rate. HDFC, HSBC, ICICI, Aditya Birla, Reliance, TATA, these are the few examples of companies and banks who have started their own assest management company.All the companies starts different kinds of mutual funds in large numbers. Yes, For example ICICI has started more than 1200 mutual funds. So how risky is your mutual funds and what is the return depends on the mutual funds that you are investing in. mutual funds can give the return rate of 4% and also of more than 30% too. It can be of zero risk and also of high risk to. Because all this depends on where the asset management company is investing your money. If that company is investing on stocks then it will be more risky and you will get more returns and if it's investing in the government bonds then it will be less risky. Different types of Mutual funds Different types of Mutual funds depends on the basis of the investment done by AMC people. Hybrid Mutual funds in Equity Mutual Funds, your money will be invested in the stock market. So naturally in this type of Mutual funds generally the risk is more and also the return. In the stock market on which kind of company are you investing, if it's a big company then it's called as Large Cap Equity Funds. If it's a small company then it's called as Small cap and in the same way Mid Cap equity Funds. Big company doesn't have much risk as compared to the smaller ones but big companies won't have growth rate as high as it can be for the smaller companies. So risk and return both are less in the big companies.ICICI prudential blue chip fund is an example of a large cap equity fund. If you invest here for a year then after a year your expected return is of 11.3% but if you invest for 5 years then your expected return can be of 19.7% . As It is seen the more time you opt to invest in, the more return you can expect. A very useful smartphone app. It's called as GROWW This gives information about mutual funds, here you have to set every month what amount do you want to invest, for how long and you will get the expected returns. This app works by checking the history of the mutual funds.That prior to today in the last 5-10 years what has been the performance of the mutual funds, what's the growth and it gives you the number based on it's average growth. Here an example of the ICICI shows that you will get 19.7% return in 5 years, this is an expected return rate calculated by this app. based on the history of this mutual fund So it's a very good things in this App to calculate the expected returns of the mutual funds. But one thing keep in mind that this is an expected return not the guaranteed return, it still depends on the market since the mutual fund has given such a performance in the history that doesn't mean that will perform the same way in the future. It still depends on the stock market so it will have risk, especially because it's an equity mutual funds and investment is on the stock market. So don't just look at the returns rate and invest. Pros is that the risk is lower as compared to the bench mark that means among all the other Large cap Equity funds, the benchmark of the risk of this particular fund is less . So this is a good point here that compared to the other ones this has less risk. Other point is lower expense ratio is 1.16% . What is Expense ratio in Mutual Fund company? It is that percentage which is the part taken by the asset management company as their profit. basically the commission for investing on your behalf. So this is lower as compared to the others which is again a good comparison. If look at the more pros then you will see that it's returns are more than the bench marks in 1 yr, 3 years, 5 years. In some mutual funds they give one year 1 return more than the bench mark and less in 3 or 5 years ,that means it's better for short terms. In cons it says that asset under management, that means they have total value of the money this company has invested at different places has crossed 15000 crores. so it happens that if the value crosses a particular point then the returns rate gets decreasing slowly. Here the investment is done in the large, medium and small cap or it's done in different companies. that is ELSS, this is a special type of Equity fund where you can save our tax. You can save the tax on it's profit. The fund manager purposely invest on such places where there's high return and also has high risk. As for Example IDFC Tax advantage is an example of an ELSS funds with the expected returns of 11.3% within a year. here specifically such companies are invested on which belongs to a big sector like Agriculture sector All the companies which are under the agriculture sector, they are investing in on. One example for this is UTI transportation and logistics funds. so the investment is done in that sector ,these funds are more risky, since all the investment is done in one sector so if the sector is going down everything depends on that. The last type of equity fund is Index fund. are passively Managed funds there is no agent of AMC is looking at where to invest the money here. These are passively managed that is according to the market's rate's up and downs they too go up and down.Looking at the price of Sensex and Nifty it varies. In such bonds, if the Government needs money and it's not getting that through the budget then the government borrows money from the people. and take loans from the people. It is called as Government bonds. You can invest here, the government will return you the money after a fixed interest. Debt mutual funds are of various kinds, liquid funds Gilt Funds Fixed Maturity plans liquid funds. Liquid funds are those mutual funds which can be easily and quickly converted in to cash. In economics language ,liquid is something which can be easily converted into cash. So this thing can be converted into cash within a day or two. But it has a very low risk, such low that you can basically consider this as an alternative to savings account. Asset liquid fund is one such example where you will get the return of 7.1% in a year. Gilt Funds :these are those funds where Investments are done on the Government issued bonds. So technically it has zero risk because it's never possible for the Government to not return your money. Mostly the interest rate can fluctuate. Fixed Maturity plans: and this can be considered as an alternative to Fixed deposits. It has very low risk just like FD and it is done for a fixed time. For a specific time investment is done here and you can't take the money before that. So these are the few main types of Debt funds there are more like Junk Bond scheme. Hybrid Mutual Funds:basically its a mixture of a debt and equity mutual funds. Some people wants to invest in the stock market but don't want to invest all the money there and also invest some amount in the Debt instruments., so hybrid mutual funds are for them. If most of the money is invested in a Debt fund then it will be called as the Balanced savings Funds Approximately the ratio is 70:30 of equity and debt fund. and Hybrid mutual funds too have different types like arbitrage funds. The biggest advantage of mutual funds in comparison to other investment is that it is already diversified.Your risk gets very low due to diversification, because you are not investing at one place so if one thing crashes so it won't affect your money. So in comparison to the stock market, gold, real estate, mutual funds are less risky however the exact risk depends on the mutual fund that you are investing on. One more good advantage is that it is affordable, you don't have to invest a big amount altogther You can use SIP and invest a small amount every month. and all the investment of the mutual funds, friends is done by a professional expert or a fund manager who decided where to invest and where to not. This you don't need to so it's again a big advantage that an expert is working for you. Mutual funds has a disadvantage too. If you are giving it to an unknown person, you don't know how its going to perform. however he is an expert but you can't trust 100% that an expert will be right all the time. But the biggest disadvantage that used to be for the mutual funds earlier is that the agents used to take a lot of commissions for investing in the mutual funds. They say that give us the money we will invest for you in the mutual funds and deduct a lot of commissions for themselves.